Home > Types of Surgery > Can Robots Perform Operations? Robotic surgery systems are commonly used in heart operations and also in surgery to remove the prostate gland in men suspected of having prostate cancer. Not actual robots but robotic technology is becoming a well accepted tool in modern surgery. Techniques are advancing all the time and robotic surgery is particularly useful for microsurgery and very detailed operations in which very fine control is important. Robotic surgery systems are commonly used in heart operations and also in surgery to remove the prostate gland in men suspected of having prostate cancer. Several manufacturers have developed robotics for use in surgery and all have different uses and applications but have the same basic working method. The surgeon does not touch the patient or the operating tools directly, but controls them using a computer console, viewing what is going on using a high-definition monitor that is linked up to a camera. The major plus point of using robotic tools operated by computer is that the surgeon can direct the movement of the instruments much more precisely than if he or she was holding them. This is essential when the site of the operation is very small – such as microsurgery to link up blood vessels. The other advantage is that robotic tools can be used on long thin arms and more tools can be used in a small space. The companies that make operating systems of this type constantly ask for feedback from the surgeons using them. Once thing that doctors have said they miss is the sense of touch and feel that they get in a conventional operation. Being able to judge what is happening in a human body is more difficult when you are one step removed. Some surgeons have described operating remotely using a robotic system as holding surgical instruments with a pair of chopsticks. Manufacturers have taken these comments and concerns very seriously and have started to experiment with introducing something called haptic feedback into their robotic systems. 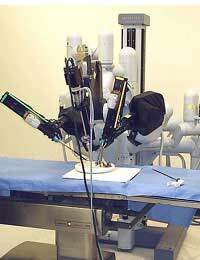 This is being done to give surgeons some of the touch sensations that they lack in current robotic surgery. The basic idea behind haptic feedback will be familiar to anyone who has played with an interactive games console such as a Playstation 3. It is possible for some games to send back signals to the controller to produce vibrations, when a car in the game crashes, for example. Building in haptic feedback into surgical instrument controllers on a surgery console is much the same, but a little more sophisticated. One thing that the new robotic surgery tools will do is relay back information on pressure and pull so that a surgeon can immediately realise if he or she is pulling to tightly on a suture, or is meeting unexpected resistance when cutting through a tissue. The technology to allow this to happen has not yet been perfected but the newer systems that are just being released have an interim measure to help surgeons feel more involved in robotic surgery. The information about resistance, force and how things are going at the patient’s tissues is relayed visually via the high-definition monitor. This uses lights and displays that indicated the amount of pressure being applied – a bit like a volume control on the TV. It is impossible to predict exactly how useful robotic surgery will become but few experts expect that robotic surgery will ever replace human surgeons. The human body is so complex, and we are all different, so it is not possible to program even the most complicated computer system and robotic tools to be able to make the life or death choices that surgeons take in their stride. It may, however, help surgeons use their resources more wisely and to increase the safety of operations as haptic systems could make excellent training tools for surgeons learning a new procedure.